Diego is the estate boss and he takes care of the milling capacity and schedules the process so that the olives don’t have to wait around after being harvested. He waits for the buckets of olives to arrive the at the mill. I try not to get in his way too much when I am there so he can do his thing. The first thing he does after the olives arrive here at the mill is to clean them. One of the tools we use for cleaning the olives is the leaf remover. We made this apparatus by hand and it does a good job. After the olives have been picked from that point on is a race against time. We want the best possible oil so the olives must be pressed within the first couple of hours after being harvested. After the olives are cleaned they are placed into the hopper that sits on top the press. 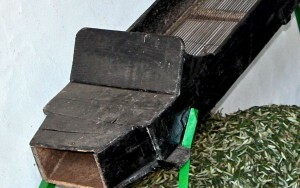 The hopper only allows a certain amount of olives to be pressed at a time and the process is slow. Everything gets crushed in the press and you can hear the commotion from outside the milling room. Then there is the smell of freshly crushed olives. The only thing to do at this point is to wait for the oil to start pouring into the strainer with a piece of bread in your hand. 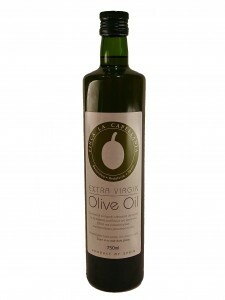 Finca La Capellanía extra virgin olive oil is made from olives grown on our Finca La Capellanía estate. This is the only way for us to guarantee a 100% organic extra virgin olive oil. Beside we have neither jenny nor jack asses working round the clock on the estate as was done in the past to press other people’s olives. We use a small all in one press I purchased in Italy and it can only press between 60 and 80 kilos per hour. The oil is then placed in stainless steel containers and left to settle for about a month, at which point it is then bottled at the farm. After it’s all said and done, this is what we will have to offer January 1st, 2013. As the oil is unfiltered, it is normal to see a small deposit at the bottom of the bottles and the quality is second to none. If you would like to place an order within the US then contact the friendly folks at: Paumanok Vinyards in Long island New York. This entry was posted in Blog, Oil Production and tagged olive harvest, olive oil, organic extra virgin, Picual Olives by oliveman. Bookmark the permalink. Today I was talking with someone that suggested that there should be an organic plus (O+) category for those olive oil that were made from olives that came from trees that never had any man made fertilizer or any other chemicals applied to the trees. I would be interested in hearing the thoughts of anyone.